Boil macaroni in water with salt and 1 teaspoon oil. Drain and keep aside. Dissolve soup cubes in little water. Keep aside. Heat olive oil. Fry garlic paste and onions till transparent. Add mushrooms, pepper and dissolved soup cubes. Cook on low flame. In a separate vessel bring soya milk to a boil. In another vessel fry the maida in 1 teaspoon oil for 2 minutes. Gradually add the soya milk and mix continuously to avoid lumps forming till it becomes creamy in consistency. 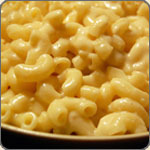 Add boiled macaroni, mushrooms, parsley and mustard paste, mix well and pour into baking dish. Garnish with sliced tomatoes and capsicum cut in rings.